Things I liked: This case has just enough room for all my supplies (including my pellets). It's easy to set up and disassemble and hold the rifle firmly during cleaning. Things I would have changed: The only thing that would be nice is if the molded an area where the two rifle supports could be snapped into place so that they have a permanent location. Other than that, everything works great. What others should know: I would recommend either this small case or the large one to any airgunner who has more than one air gun. It will easily hold all the supplies you need (unless for some reason the supplies you are purchasing are very large :) ). Things I liked: Braces are nicely cushioned. What others should know: Braces take up alot of room because they don't lay flat in bottom of case. Things I liked: This is a good size. Holds all your cleaning supplies, Etc. And is good support for cleaning your rifle. Things I would have changed: Can't think of anything I would change. This is a pretty good deal for the money. Things I liked: holds all my stuff for bench shooting and works well for holding rifle while working and/or cleaning. Things I liked: The size and configuration is great. I keep oils, small tools, cleaning supplies, etc. in the top tray. In the lower, nested tray I keep numerous tins and tubes of various pellets. It is deep enough that two tins can be stacked and the top tray still fits properly. In the bottom of the case under the trays I keep larger cleaning supplies, the attachable "arms" of the gun rest, safety glasses, binoculars, etc. All the pieces of the case fit together securely and I do not have any concern with anything coming loose while carrying it. Things I would have changed: The top tray has fixed dividers. It would be great if they were configurable, but for the price this is a great case and it really is not an issue. What others should know: This case can definitely carry everything needed to go shooting or keep most essentials tidy and portable around the house. Things I liked: Since I'm just now getting "into" higher tech air weapons..., this smaller case is sufficient for the few things that I want to carry around, or keep together. Light weight, two segmented upper trays, sufficient storage space at the bottom. Things I would have changed: Those two side latches leave me a little at ease, sometimes. In the past, I've had similarities with other cases. If you aren't POSITIVE that both of them are secured..., you stand a chance of picking up the handle, and one end drops down, spilling out the contents. Definitely don't get a 'warm-fuzzy' feeling that the lid is reliably secured..., when the plastic knuckles in. Knowing that, I take extra attention to make sure I'm not going to picking up mixed calibers or types of pellets, in the grass. :( Additionally, when I bought this, I was hoping the internal structure of the design, might support my 190-lb weight, when used as a seat, with a MTM shooting table, while zeroing my rifle. Not exactly what the box was designed for..., but we can always hope. Would be nice if the side latches could be secured, while the sun rests are in use. What others should know: That's pretty much it. In actuality, the $29.95 price tag is pretty comfortable..., all things considered. I'm a selective shopper..., checking out the internet and any sources for sporting equipment. My first purchase from Pyramyd Air was Dec-2011. Prices are GREAT..., delivery time is OUTSTANDING..., and the level of assistance from the people in Customer Service and/or Technical Support is EPIC. Kudos and accolades to everyone there. Things I liked: Nice, compact, well organized case. 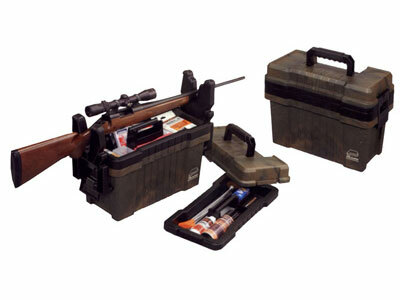 Great for keeping all your shooting supplies together & organized. What others should know: You'll like this case. Get one! Things I liked: Very roomy and solid. I like that the handle is connected by all the trays. Things I liked: Ease of use, lite and sturdy ample room for accessories. and for cleaning my rifle I find it very useful.